This is an interesting section of KE Space. 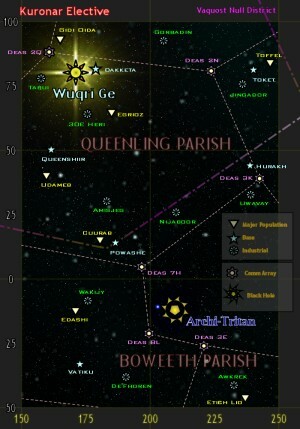 Aside from the major system of Wuqri Ge, which is a major clearinghouse for all things medical, we have the point known as Archi-Tritan, a major black hole. One can see that even the powerful Comm Array Network has to detour around it. designer note--Many props to the Perry Rhodan series for the name of the Black Hole.